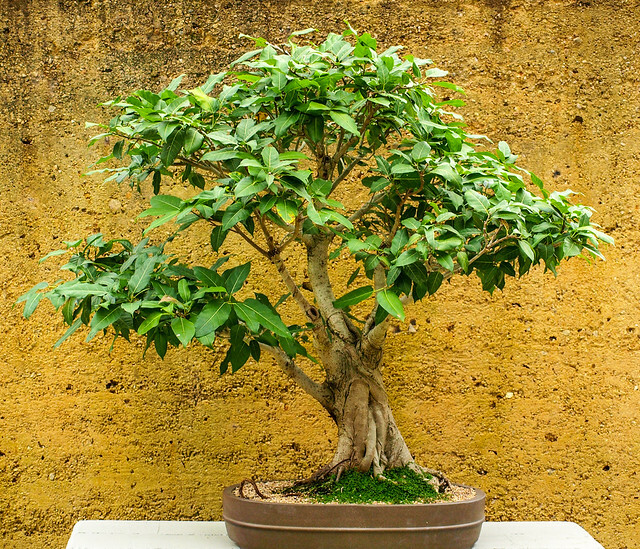 Bonsai is the art of growing ornamental, artificially cultivated trees and shrubs in containers. This Japanese and Chinese art form has been popular for centuries. Plants are cultivated using various techniques to produce miniature trees. These trees mimic the shape and form of full-sized trees found in the wild. The Bonsai House at Brisbane Botanic Gardens Mt Coot-tha is next to the Japanese Garden. It displays about 50 plants including figs, conifers, camellias, azaleas and maples. Some specimens are more than 65 years old. The focus of the collection is on sub-tropical plant species with a growing collection of trained Australian native plants. Many of the bonsai were donated from the original private collection of the late Len Webber. Len was one of Australia's foremost published authorisities on bonsai. The collection is maintained by botanic gardens staff and volunteers from the Bonsai Society of Queensland and Bimer Bonsai Club. The Bonsai House is open daily between 10am-4pm and entry is free. View the Bonsai House photo gallery as a slideshow or view photos individually in the Bonsai House set in Council's Flickr account.